Today, in spilled tears over things we will never be able to afford, I present Sarah Jessica Parker's fabulous bathtub ensconced in her awe-inspiring $22 million Greenwich Village house in New York City. Look At That Tub. Look At It! SJP and husband Matthew Broderick have gone back and forth about selling or keeping this house — because they've got another one in New York City — but now they've put their Greenwich Village residence up for sale this week, for the second time. According to Curbed, the 20 East 10th Street home was on the market last year for $25 million but then taken off in April of this year. Currently, the 25-foot wide, 6,800-square-foot space with five bedrooms and seven fireplaces is available for the low, low price of $22 million. 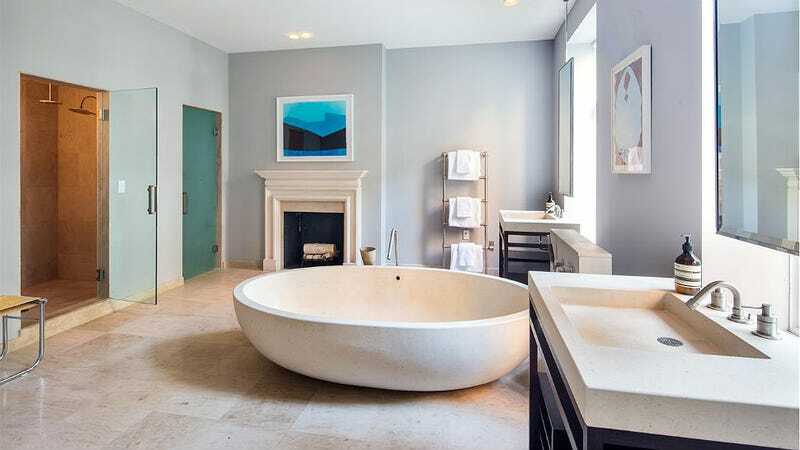 Just think of all of the fire-side baths you could take in that hard-carved stone tub! Just think of all the Divergent and 50 Shades books you could read in that thing! Image via Douglas Elliman Real Estate.